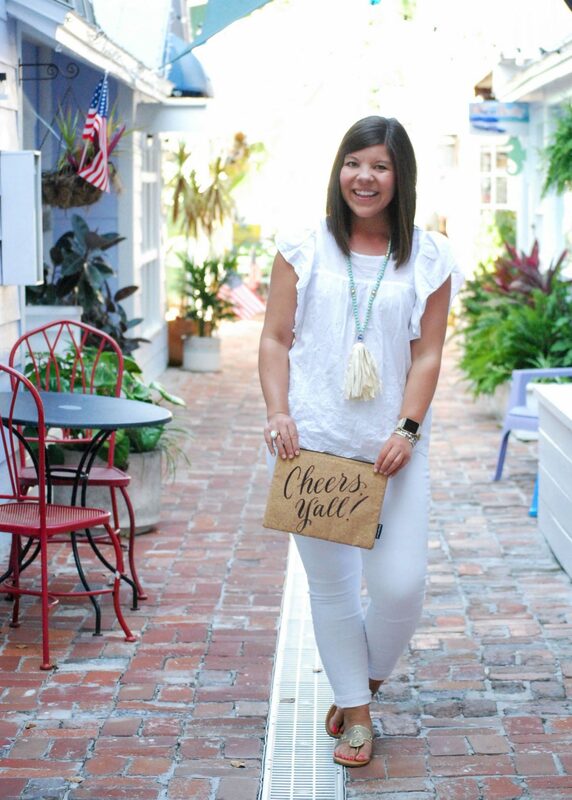 There is nothing more refreshing than an outfit full of summer white. See how to make your bright look pop! Normally white scares me, like nightmares about sitting on a ketchup packet scares me 🙂 But this newly (ish) minted 30 year old is all about taking on challenges that scare me- like making it through a day unscathed in my white! ha! I haven’t shopped at Gap in what feels like years, but as soon as I laid my eyes on this ruffles, eyelet goodness I couldn’t help but get heart eyes for it. I’m all about elegant simplicity in the summertime and this top nails it! 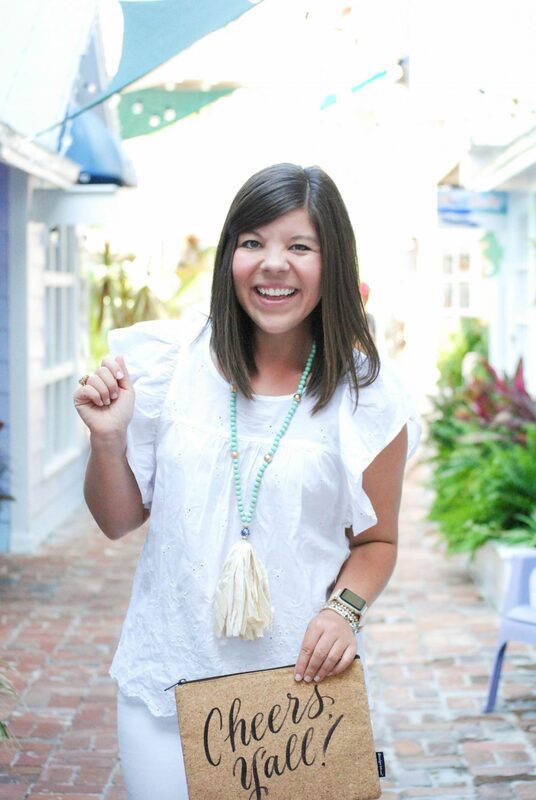 I wanted to make sure my look still had a “pop” factory so I added in my favorite summer accessory- a big tassel. The turquoise beads really stand out among the sea of white and did you catch the ginger jar bead on the bottom (swoon!) 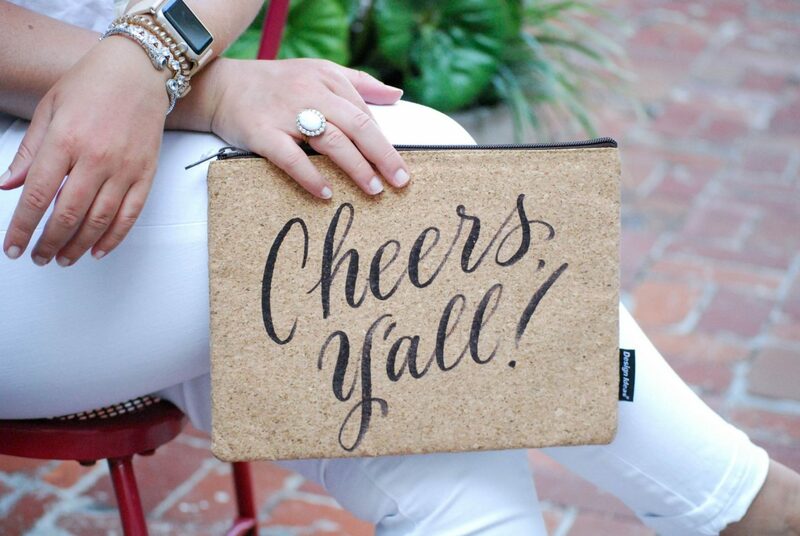 🙂 Also, we have to turn a few heart eyes to my new “Cheers Y’all” clutch! 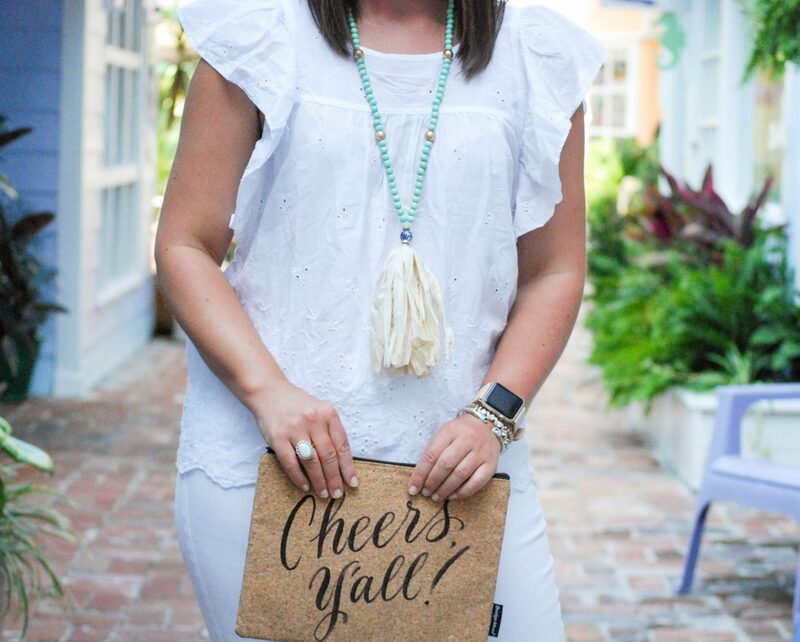 When I was at Atlanta market one of the booths was creating custom clutches and this year I got “Cheers y’all” on mine- I figured it was a perfect saying for me. ha! I’m gearing up over here for a BUSY week at work because I’m headed to NYC next week for market and I have so much to prep- think reports out the wazoo! If you’ve got a busy week too, hang in there, we got this! 🙂 Let’s make it a great one friends! I love wearing all white during the summer! But I’m with ya and it can be scary to wear haha! This outfit is so cute and I love that top! Loving the all white look! I’m going to be so sad when summer is over and it’s out of season! An all white look is my favorite in the summer. Love dressing it up with colorful shoes + accessories. 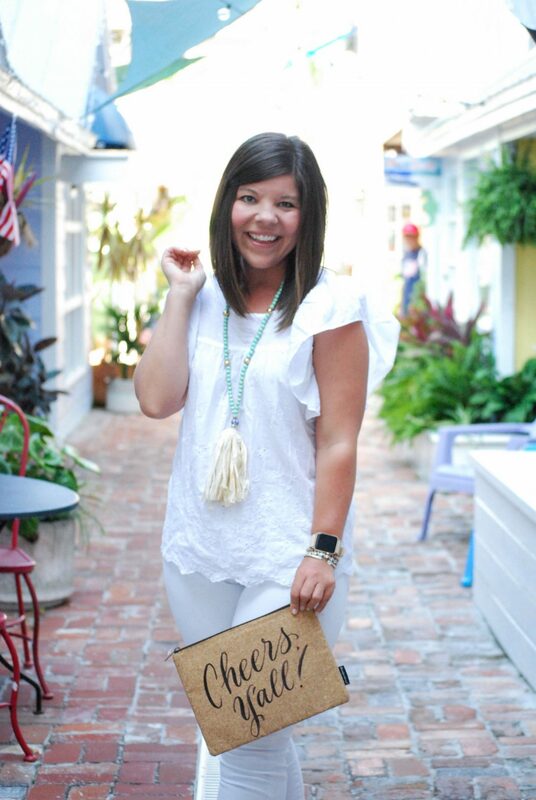 I love this all white look with the pop of mint in the necklace! How cute are you??!! I love this look and all the pretty details!!! So fun!! Such a chic and cute look. Love all white ensembles. 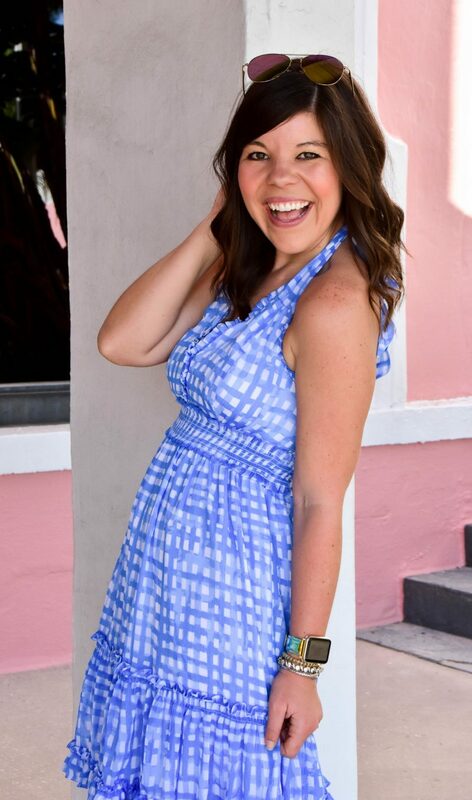 Love this look Gentry! I wish I had enough courage to wear white on white – my worry is always spilling coffee! 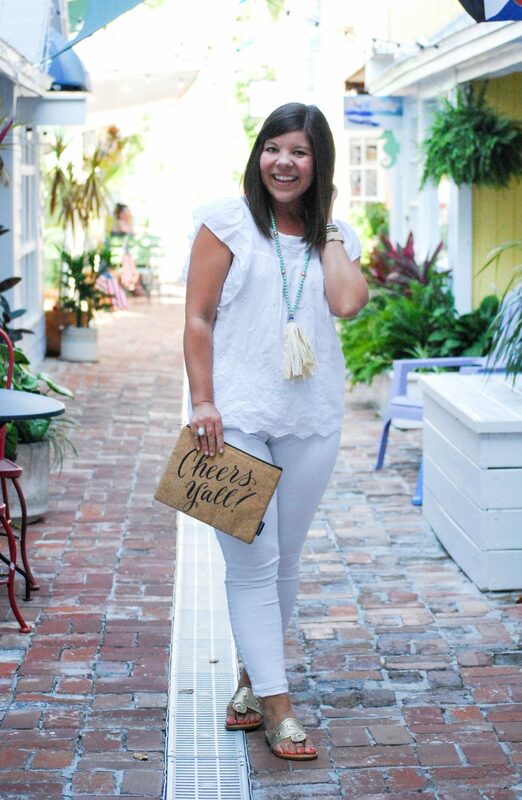 I am loving the white on white and this clutch is so cute!! Perfect Summer look. You are the epitome of summer! Such a beautiful and airy look. I love it! I absolutely love all white come summer time. And I adore your sweet top! You look so cute!! Love the top and that cute clutch!! I love that while your outfit is entirely white, it’s not boring in the slightest. 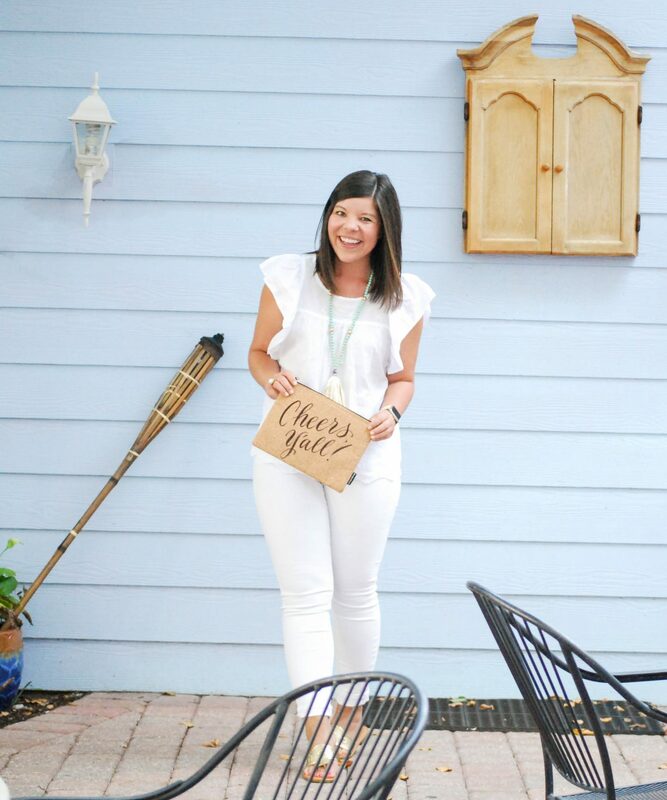 Sometimes monochrome outfits can appear lackluster, but you found a gorgeous blouse and accessorized brilliantly to make it super chic and flirty-fun! Aww thank you so much Stephanie! 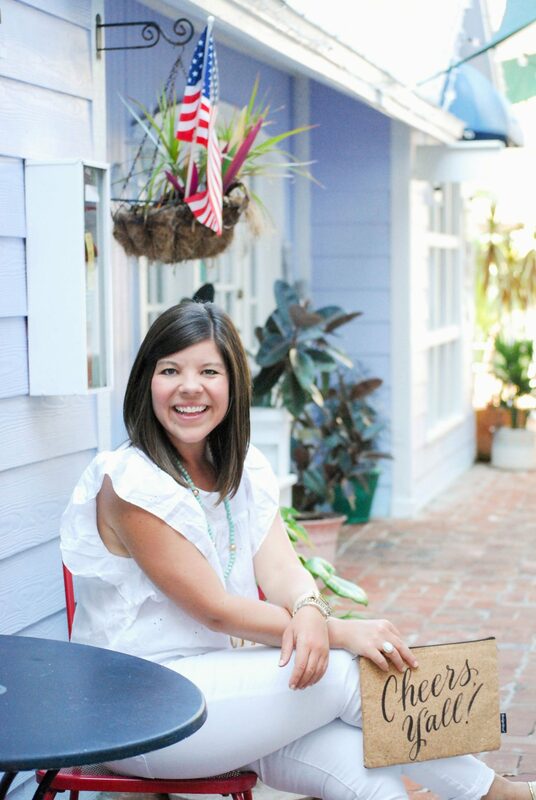 I always love your fresh and Southern-inspired outfits. Great accessories, especially that bag. Such a pretty and elegant look dear! Love the top, looks so comfy and breezy. Cute accents of colors you have there too! You are so darn cute! I love this all white look!